Description of "Lights Camera Action Steps on Money Management"
The book helps you get started on how to take the right financial decisions in your life. The book helps you to know more about the basic concepts of financial management and also the math & psychology behind your finances. You will know more about the tools and technology that can help you with your finances. You will know more about buying online financial products that can save you a lot of money. You will now buy only the right financial products that you need and understand. You can also choose from well researched recommendations of financial products. Each chapter of the book will focus on enlightening you with critical money concepts (Light), useful tools to manage your money (Camera) and then take real (Action) steps. Ranjan Varma has over 20 years of work experience in the financial services industry. Ranjan Varma has been interacting at his blog @ http://ranjanvarma.com since 2007, with posts on how to manage money. Ranjan edits a personal finance website @ http://personalfinance201.com. 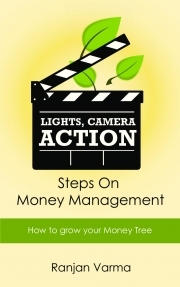 Reviews of "Lights Camera Action Steps on Money Management"